If you’re a card carrying member of the cloud storage club then you might opt to save images, links, and other files straight to the cloud rather than your local drive. 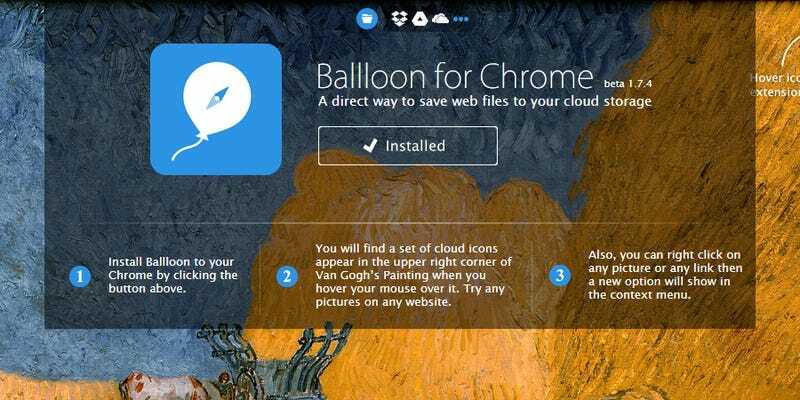 Ballloon is a simple extension for Chrome to save files directly to Dropbox, OneDrive, Google Drive, Box and so on. It uses a Google+ account to identify you and you then have to go through the process of signing into all the services you want to use Ballloon with. In each case you can set up a default folder so the plug-in knows where to keep files and you know where to find them again afterwards. You can also opt to choose a specific location each time. With the setup process completed, you can right-click any link or file to save it to your cloud storage accounts. For images, you see small save icons overlaid on top of the picture itself, while the extension’s icon in the toolbar helps you keep track of ‘downloads’ and access the app’s settings. It’s particularly useful on Chromebooks, where there’s not much point saving files locally anyway.